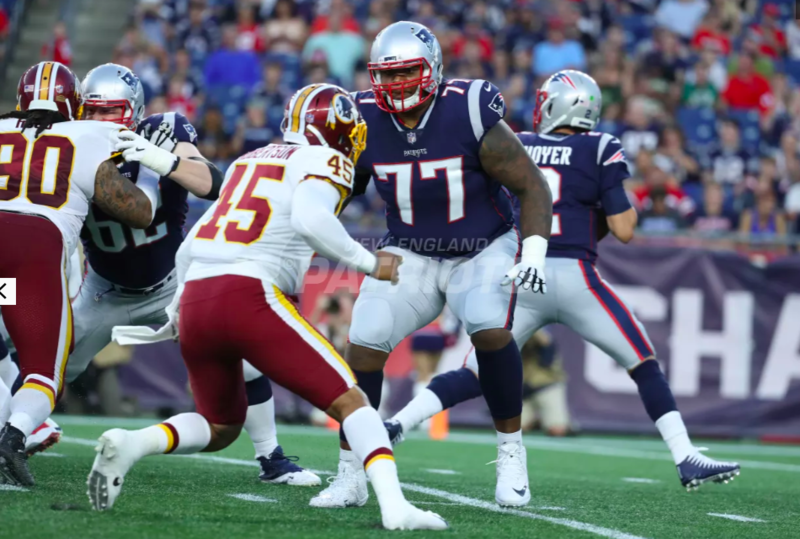 How did new starting left tackle Trent Brown look in the Patriots' preseason opener? Entering training camp, sorting out the left tackle position was priority number one for the Patriots. With Nate Solder now a member of the New York Giants, the Patriots needed to fill a massive void on Tom Brady’s blind side. To give themselves options, as Bill Belichick so often does, the Patriots attacked Solder’s departure by acquiring two viable replacements for the long-time Patriot. On the second day of the draft, less than 24 hours after selecting offensive lineman Isaiah Wynn out of Georgia with their top pick, the Patriots traded a third-round pick to San Francisco in exchange for offensive tackle Trent Brown and the 49ers’ fifth-rounder. A move that, at the time, got lost in the shuffle of the madness of draft weekend. However, It’s the under-the-radar move, not the first-round pick, that has snatched the job from day one of camp and has been the starting left tackle since he arrived in New England. The 6-8, 380-pound Brown, who head coach Bill Belichick acknowledged was the largest player he has ever coached, has awed spectators at Pats training camp with his athleticism and fluidity for a man of his stature. We got our first-look at Brown in a game for the Patriots on Thursday night, and the big-man backed up everything we’ve seen in practice with his performance against the Redskins. Brown didn’t allow a single pressure in 13 snaps as a pass blocker during the first half Thursday night and displayed a rare combination of quickness, flexibility, and power in the run game as well. One thing you’ll find out quickly about Brown is, although he’s a mammoth of a human being, his approach to pass blocking is often passive. Instead of using his size and strength to take it to the opposition, he usually sits back and lets them come to him. Here, you’re going to see how Brown’s height (6-8) and depth out of his kick-slide allow him to remain patient in his pass set. Brown is going to win this rep by winning the half-man relationship with the pass rusher across from him with his gigantic strides and quick feet. He keeps his hands back which forces the defender to declare his intentions first, giving Brown the upper hand. Then, you see him engage the defender, anchor, drive and bend before finishing with strong hands and arm extension. His stride length and ability to move his feet on his kick-slide allow him to square-up on pass rushers to force them to go through him instead of around him, and going through him is nearly impossible. Brown’s foot speed is truly rare for someone his size. On this play, Brown is going to sit back again and allow Brandon Bolden to execute a chip block on the edge rusher on his way out of the backfield. However, Redskins outside linebacker Pete Robertson is going to see Bolden coming and tries to dip inside to avoid the running back and to catch Brown over-setting to his help. Unfortunately for Robertson, Brown can plant his inside foot and shuffle his feet to cut off the inside rush. Then Brown comes through with his two-hand punch and arm extension and stymies Robertson. Brown does get lazy at the end of the rep and disengages, a coachable moment, but the ability to change direction that quickly at that size is remarkable. Brown’s athleticism also shows up in the run game. He’s surprisingly light on his feet and able to execute blocks on the move, and his flexibility allows him to leverage blocks as well. On this play, the Patriots run an inside zone blocking scheme with Brown firing off the ball at a 45-degree angle. He’s going to chip with his inside shoulder on the three-technique defensive tackle to double-team at the point of attack with left guard Joe Thuney. Then, once Thuney is in control of that block, he climbs to the second level to push the linebacker past the cut-back lane for running back Jeremy Hill, leading to a big gain. One small, but key, thing to notice here is how Brown can bend and lower his pad level to get the necessary leverage to execute the second block in the sequence. He has terrific knee bend. Another area where Brown has impressed since arriving in New England is his ability to make blocks on the move in the run game. Here, Brown is going to pull out in front of this outside toss. He gets to his spot in plenty of time, and again, we see that flexibility as he bends over to get a two-hand block on his man. Ideally, Brown would take the nearest threat to the running back and pick up the linebacker that makes the tackle on the play. That’s not his assignment, however, as Joe Thuney is supposed to climb to that linebacker but gets caught in traffic. On the one hand, a teachable moment in awareness. But on the other hand, reaching this block on the move and getting two hands on the defender is not easy. Under Bill Belichick, the Patriots have always had a plan at left tackle both for the short and long term. At the beginning of Belichick’s tenure, the job belonged to former Pro Bowler Matt Light, and then the team drafted Nate Solder in the first round to make a seamless transition from Light to Solder after Light’s retirement following the 2011 season. Trent Brown may not be a mainstay in New England like Matt Light was, but at the very least, he gives the Patriots a starting-caliber left tackle for the 2018 season while they continue to develop first-round pick Isaiah Wynn. Remember, Solder didn’t replace Light until his second season in the NFL. The Patriots want to make Isaiah Wynn earn the starting job, and they don’t seem ready to throw a rookie on Tom Brady’s blindside right away. The primary concern with Brown is conditioning. In the past, Brown has worn down as the season goes along, which has prevented him from keeping a starting job, whether it be at left or right tackle, for an entire season. If the Patriots can get, and keep, Brown in shape for the entire season, he continues to prove that he has the necessary tools to start at left tackle for the defending AFC Champs. Next articleFilm Review: Did Patriots Find Hidden Gem in Rookie Ja’Whaun Bentley? Potential Patriots — Trades: Move Up, Or Move Back?